Here in Central Ohio, the Cailleach continues to rule, reminding Brigid she is still queen for now. Many of my non-Pagan friends are complaining up and down, saying winter needs to go. I say give the Cailleach her time, we will all be whining we are too hot soon enough! Soon, Beltaine will be upon us. 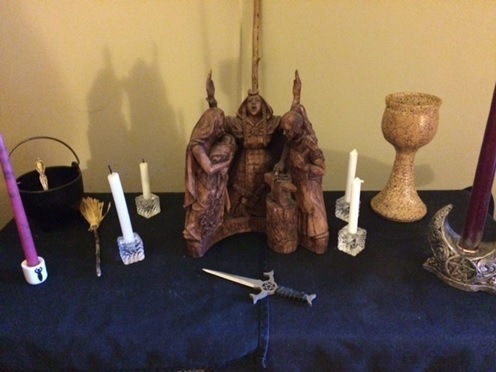 If you have read my past articles, you know I love to plan a gathering for Beltaine. It’s been a year, or has it been two, or has it been three???? Since I have hosted a Beltaine gathering? I will be honest. Sabbats, for me, just are not that special when I’m alone for them. It’s all about the fellowship, and doing ritual for me. A simple internet search for “The need for religious kin” turned up nothing. I read a few articles about mankind’s need to have companionship, and be surrounded by like-minded individuals because we feel most understood and validated by them than the people less like us. I did not find the references to share to support the point I want to make, so I’m just going to make it myself. Many of us find we feel the presence of whoever we worship best in the presence of other worshipers. A Xtian I once knew referred to it as “sanctification within the community.” As we become the hands, voices, and deeds of our gods, we feel their physical presence through circling with others. In magical traditions, group magic raises more energy than magic worked alone. I got so used to doing everything with a group, when I stopped doing so, I felt completely alone. My health and mobility dictated I had to do so, and not only did I stop hosting, or going to other people’s rituals, but I also stopped working. Then I stopped driving. Then, I went some months without leaving the house many days. If you want to find out which of the friends and friendly acquaintances feel you are important to their lives, drop off the map, and you will find most all of them forget all about you. They easily replace you with other people who are conveniently wherever they are, and you may as well have never met them. So, for those of us who have fallen off the map from the Pagan community, a Sabbat, which used to be the highlight of our lives, is just another day. Now, I have already said I experience my gods through others. Examples of that are when somebody is acting as an oracle, and guidance from the goddess comes. Another example is when we are doing a fund raiser together for a good cause. This is the gods using us to help one another. Yet another example is when you need emotional support, and another human being embodies the compassion of the goddess. Sometimes, we spend so much time working with others, that we have little to no time on our own. This was true for me for many years. I heard the voices of my gods spoken without human tongues. They visited me in dreams, in waking, in nature, and in the gut instincts I got. Whenever I asked for communication, they answered. It’s not like I had NEVER spoken with them on my own. It just became habit that I spoke with them in the presence of others. I spent so many Sabbats and gatherings in the company of others, I began to hear only that particular method of communication from them. However, I’ve been like this for a while now, and I have made some realizations. My gods have not fallen silent. I just had to listen differently, and I made some realizations about how solitude can bring communication with them. I have learned something I never could have before when I was always busy, always surrounded with people, always planning, organizing, working, and always moving. How to truly be still. How to be truly silent. How to be truly alone. And how to be comfortable with that. Most within our circles take time to do the form of meditation where you sit, do nothing, try not to move at all, and try to make your mind blank. Can you be completely alone for many hours or days at a time, go no place, see nobody, and do very little besides the necessary? Can you endure tedium? Being unnecessary to everybody? No contact from large amounts of people for long periods of days, weeks, or months? Can you live for a time, basically being as a hermit? Away from the hustle and bustle of life, the influence of society, and the expectations of others? I am not saying I think everybody should just hole up and do so forever. We have all seen the Hermit Card in Tarot decks. He turns up quite a lot for us. He represents going into ourselves, to search our souls, or retreating into solitude for a time. Depending on who you speak to, reversed can represent isolation and loneliness, or it can represent coming out of solitude. Historically, some of the most famous hermits have been very religious. Christians still cloister some of their orders of nuns and priests, away from society. It is believed this withdrawal from society cultivates a closer relationship with the divine by some. In the middle ages, it was not uncommon for hermits to build huts into the side of the church, and be ceremoniously bricked up permanently. They relied on the charity of people going to church to bring them food and necessities, and they enjoyed a window into the church where they could hear liturgy. These people were called anchorites, and people visited them for advice, as they were believed to have dedicated their lives to communing with their god and the angels full-time, and were considered very wise. One of the magickal workings to discover one’s True Self, and the Holy Guardian Angel in Thelema entails months of a hermit like existence, and devotion to prayer and magical operations. The solitude allows for removal from distractions and interference of others. In the quest for enlightenment, the Buddha became an aesthetic, withdrawing to be a hermit for a time. Monasteries in many different religions have a structured life of prayer, ascribed exercise, a specific diet, a uniform, or habit, and life away from he mainstream society in general. Devotees may be called to take vows of silence, or chastity as well. I refer to this as cloistering, and cloistered life away from society supposedly gets you more in touch with who you are, and what is important. My life has been semi cloistered for over three years now, and there are times I wonder how I lived a lifestyle of constant noise and crowds. I have learned a different side of reality. I realized I did too much- Society pushes us so hard, demanding we do MORE, buy MORE, ARE MORE. We are never enough, and we constantly have to prove we are worthy of simply existing. I found out that is wrong. Our worth as living creatures can certainly be diminished if we are terrible people who do terrible things, but our worth is not proven by our worldly accomplishments, and I discovered that because I just could not accomplish the volume of things I once did anymore. By nature, humanity is quite competitive, but that can become toxic and unconstructive. Sometimes, we struggle to do SO much, the quality of our work suffers. Quality trumps quantity, I found. What I do does not create who I am- I was told this by a very talented psychic long ago. The things we do change every so often, and often, we suffer identity crisis as the tasks and jobs we complete transition. We are not our jobs or our accomplishments. We are people, not actions, or things. In stillness comes peace- I had initially misinterpreted it as boredom. The silence was deafening. Now, TOO much noise overwhelms me, be it sound noise, or visual noise. I leaned to slow down- Not only do I no longer focus on quantity over quality, but I realize speed does not make things any better. Oh, there are going to be times tight deadlines loom, but times when they don’t, slow down, and enjoy the process. In the quest to do more, faster, we forget one another- We leave behind our loved ones, and neglect the time we should be spending with them. I cannot tell you how many people I have spoken with who get to middle age and beyond, and state they regret NOT spending more time with loved ones than they have. If the focus is on DOING things, instead of moments with loved ones? That is all our life becomes. I have time for things I said I wanted to do for years- Since leaving the house and working was not on the front burner anymore, I found time to pick up art again. I stepped away from it when I graduated college, and both painting and writing was literally abandoned, as I focused my time on career. I did study music for some years, but I never excelled in music. The written word, and art were my first loves, and I do both again now. I do not miss the loud, busyness- At all. A lot of people envy me- I have had so many say they wish they “did not have to” leave the house. On one hand, I point out it can be horribly isolating sometimes, and I tell them to be careful what they wish for. I am a very productive, self-starter, and a lot of people NEED a schedule to leave the house, or they just sit and rot. I always find things to stay busy, and a lot of people cannot endure boredom, solitude, or lack of excitement. A lot of people who envy me could not endure this. I am online more- Lots more. I do communicate with people all day long through social media and texting. I read and research more as well. I am not saying everybody should cloister, or semi cloister. I am saying, the Catholics, Hindus, Buddhists and others are onto something in their assertion solitude can bring you closer to the divine, because it changes the way you think about yourself, the world, and life in general. Personally, my concentration is better. I focus on the important things now. I read and study more. I have slowed down, which makes it easier for me to notice things. I pay attention to people and experiences more now as opposed to things, and tasks. I do not compare myself to others as much, being as competitive as I used to be. All of these things create more connection with the self, and it is within us our connection with the divine lives. Solitude can be used as torture. Prisoners in solitary confinement don’t benefit from it. The sick who are shut-ins or whose impairments keep them from communicating certainly don’t benefit either. It seems religious hermits live as such only temporarily, or in such a way they are still able to connect with others. Monks have a community away from society, but they do so in groups, and they have each other. The public comes to them for religious guidance as well. I have already mentioned the medieval Xtian hermits whose huts were bricked into the church, and they saw and visited with people often. They just never left. The Buddha was a hermit for a time, but not for very long. Human beings need one another, for certain, but sometimes, we need time alone, to retreat into ourselves to find the aspect of the divine we cannot experience with other people. This alone time has to be balanced with time with other people, or else it is not good for us. Each person has their own level of time they need alone, and with others. Too much, and it’s bad, not enough, and it’s just as bad. For Beltaine Working, I’d like to recommend how to find ways to have more alone time for scared workings. I know it can be difficult. My friends who are parents and or have careers can attest to this. There have been times in my own life when I worked, sometimes two jobs, that the only time I had to myself was when I fell asleep, or was getting ready to leave for the day, or just getting in! I probably sound like somebody who has no place dictating to busy people how to carve out quiet, alone time! When everybody else is asleep- Some of my friends who have kids swear this is the only time they get to themselves. That time is often filled with chores, paying bills, and or showering. It also, sometimes eats into their sleep time. Any spare second of time you get when it is crazy busy that NOBODY else is in the room with you can be gold! If all you get a chance to do is light a small candle or stick of incense, so be it, but it is your time. Short Mantras- Everybody loves time to relax, unwind, and sit in silence to meditate, but not everybody has the time. Even if you have time, there are days when everything is just so crazy and hectic, you simply cannot focus enough to truly meditate. Some people can do so no matter what! But for those who lack the time or ability to focus, short mantras, or sayings that are meaningful can help. One for me is the reminder “I create all that I am , and all that I will be.” Each of us needs little reminders for support all the time, and when we cannot read or meditate to reset our minds, personal sayings can supply some relief. A Weekly Hour- Is there a day of the week you can get a solid hour with very little deviation? Say you do two classes per week and have an hour and a half between them all. Can you head to a quiet spot during that break, and have your “Quiet Hour”? I have even known some people to utilize the time they commute to and from work as their quiet time with books on tape of sacred readings, or even spiritual music. Go to your car for lunch if the breakroom is busy and noisy. It might not last an hour, but a few quiet moments count. Lighting the Candles before bed- This is one thing my mother did. We had a low table in the hallway, and on it, she put a white tablecloth, and a single red taper candle. We would kneel before it to say our prayers together at night right before bed. I was small, and she was a single working mom, so I can’t imagine this nightly ritual lasted for more than a few minutes. We prayed, she blew out the candle, and we headed to bed! Go outside, touch the earth- This is a big one for me. I have always felt best with outdoor time as often as possible. Now that I have a dog, of course, that is multiple times per day! Most especially for those who follow an earth-based path, time touching the earth, or just breathing in the sweet perfumes of her air are crucial to us. Some suggest walking barefoot on the earth spiritually grounds one. I have never found that true for myself, as my feet hurt, but some people swear by it. Have a pouch, pile, stash, or stack of whatever helps- I used to keep a small bowl of crystals by my desk at a very stressful job. I would hold the crystals to help calm myself. Carry these things in your car, in your bag, wallet, or even on your person as jewelry. I have known some people to have things tattooed onto themselves that serve this purpose. FOOD!!!!!!!!!!!!!!!!! !- Foods and drinks nourish the body, which has been called the temple of the spirit. If you are not properly hydrated or your nutrients are off, you are going to feel awful. Good tasting things, also, help make you feel happy. Joy is not THE goal for spirituality, but it can help keep you going. Maintain Self-Care- Do things for yourself. I am not talking about a bite of chocolate or a bubble bath. Do that anyhow. I am talking about respecting your body’s limitations, and not jeopardizing your health. Maybe that means shutting the TV off early and hitting the sack, or being absent from a social gathering because you are just spent. Things like this can give much provided time without stimulation the body and mind needs so we don’t get overwhelmed or exhausted. Learn to say no- This is very difficult for some of us. Ate your kids screaming to hit ONE more store, and you feel guilty, but your sugars are low, and you have to go in to work early? Tell them no, and they better stop that screaming, too! Does your circle want more of your time than you can offer, and they just can’t find anybody else but you who qualifies to write a newsletter? Well, if nobody can write except you, then they sure can’t read either, can they? So, they sure don’t NEED that newsletter. Cutting down on unnecessary activities people guilt us into provides opportunity for more you time, and thus more time for your personal spirituality. Turn it off- I discovered in a strange way, that electrical currents do not always promote rest and calm. I slept in a cave with no electric on one night, and I have got to say, it was the most peaceful night of sleep I have ever gotten. It is the only time in my life when complete darkness and silence surrounded me. I was there with three other people, and one of the men was so overwhelmed, he had to leave. It was such a foreign feeling, and not for everybody. Not everybody can have that opportunity, but you can emulate this is small ways. Turn off the radio, and open the window to listen to the birds sing. Put down your cell phone, and watch the sunset. Of course, each of us has our own personal ways of adding some quiet, alone time to our days that goes beyond anything I can suggest. I wish you a Blessed Beltaine, Blessed “Me Time”, and Blessed Be! January was called Wolf month in Anglo-Saxon. Where the starving creatures ventured into villages snapping at the young and helpless, just like the bitter winter winds. January stalks through the cold and damp towards the wet helplessness of Imbolc, lambing season. There is power in that fragility, in the force of hope. Power in the vulnerability to decide to grow and reach towards the light. February can feel more like winter than December weather wise at least in the British Isles. Sometimes we get unexpected sunshine and warmth, but for the most part it’s sleet, snow, high winds and driving rain. Imbolc to me makes more sense if it is part Valentine’s Day, part Mother’s day, part birthing ritual. It is a celebration of hope and the power of love. Sexual love, motherly love and love of life. Brides (Brigid dolls and crosses) are usually the decorations but in truth in our house, we usually finally take our live tree from Yule outside. It is still covered in lights but the ornaments are packed away long ago. We have a Spring clean. I might set up a small altar or temporary shrine to spring. Breed day, Brides day, all have a sense of sexual expectation I can never seem to muster at this time of year. It is still too cold to shave my legs! I grew up on a farm and much like Lughnasadh represents the frantic hot work of getting the hay harvest in rather than some languid holiday revelry; Imbolc is lambing season. You might have to herd sheep in from one place to another. Bring them in (or let them out, weather dependant) and hunt for stray ewes and small grey bundles abandoned on the luridly green grass. It is cold work. Usually having to be done gloveless. It lacks the communal jovial atmosphere a lot of other seasonal farm jobs have. There is loss and death aplenty. Little miracles happen too. After all these years I can’t get the after-birth off my hands. I can’t get my hands warm, my feet either to this festival. I don’t hate it. Imbolc is necessary. Birthing is hard. It is dangerous. Liminal and primal. It is a labour. A labour of love. It is where all the loving words are blown away by the roaring wind and your actions really matter. It is what you do, here and now that counts. I guess this is why I struggle with the whole modern idea of fasting and dieting around January. It feels punitive when everything already feels hard. The weather’s awful. A lot of people are sick. It feels counterintuitive to try and throw yourself into some fake “good” mood. I usually like January. For me and my family it is full of birthdays. And yet, and yet this anticipation of the grind, the work ahead feels overwhelming. So this year I am going to give someone who really needs some love some attention: me. Just do the one thing that needs doing now. Then the next thing. One breath at a time. Keeping your head where your hands are. One step. One moment after the next. I’m going to try and stop myself from berating myself at how much I have not done, and try and celebrate what I do. My bad witch self is going to clean and bless my space. Then I’m putting on a playlist designed to be impossible to feel sad or sluggish while playing. I might even eat some good stinky cheese (maybe even goat or sheep cheese) to honour the milk, blood and labour. Then I’m going to look at my “to do list” and try not to wince! I might feel up to doing something fancier on the full moon but I’m not going to force myself to “go through the motions” when all I want to do is hibernate! Self-care and self-love seem to be so far down most folk’s lists of stuff to do. I have many of the women I know running families, jobs and education who refuse to stay home when they are sick because they “don’t have time to be ill”. Women are routinely told to put themselves last and in the spirit of the birthing season I ask you to give yourself the same compassion and support you give others because you cannot fill others from an empty cup. You don’t have to be everything to be enough. “Naughty” food, be it ice-cream, stinky cheese or a decadent veggie-burger. Firstly have a long hot shower or soak in a bath. Use your best products, add some salt. Scrub it all off. Next in your ritual wear. You can either, dress up the nines. Go all out, or put on your most comfortable ‘jammies or nightwear. Just sit for a moment and take in the light and sweet smoke. Then put on your playlist and grab your food and feast. Sing-along, dance, and enjoy. When you are done extinguish your candle and if you like you can keep this as your self-love candle. You can light it if the day is dark and scary and remind yourself you are worthy. Learning to love yourself is important and honours the gift that the Old Ones have given you. As her powers leaves us quaking. Changing the world before our eyes. As I sit here writing this column, it is only a handful of days until Imbolc, which makes it easy to choose Brigid as this month’s Goddess. She is known today, by many, as St. Bridget of the Christian church. Oh, but she was and is so much more. Brigit, pronounced “Breed” started at a triple goddess in Ireland and surrounding areas. In England, she was known as Brigantia; in Scotland, Bride; in Celtic France, Brigandu. Her name means “bright one” or “bright arrow”. A great flame went out from her head and into the sky on the day of Her birth. This flame, tended at a sacred shrine in Kildare by 19 maiden women, named the Daughters of the Flame, perpetually burned; and, it was said that it was tended by Brigit, herself, on the 20th day. This flame was looked on only by women so that its’ purity would be always protected. 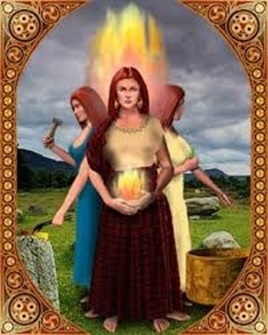 As a triple goddess, Her aspects are linked by both fire and water. Brigit is the Keeper of the flame, and is credited with the invention of smithcraft, She is the Goddess of the forge and of the Hearth in each home. She is the Poetess, the Goddess of storytelling and inspiration. She brings wisdom and guidance as the Goddess of prophecy and divination. She is a nurturer, the bringer of children as a mid-wife. She is a Goddess of healing and well-being. Numerous healing wells are dedicated to her, many in the surrounding areas of Kildare. As Christianity conquered the pagan people of old, the church found that Brigit was so loved and so revered, that they could not eradicate her worship. As they did with so many of of our ancient deities and customs, they co-opted her into the church, transforming her into St. Bridget, claiming that she was a Druid’s daughter and baptized by St. Patrick, he who allegedly drove the snakes (pagans) from Ireland. Her sacred flames burned until 1220, when a Norman Bishop, angered by the fact that men were not allowed into the presence of the sacred flame, forced his way in with his men and had the flame put out, using its’ pagan beginnings as his reasoning. The flame was re-lit in 1993; it is now maintained by the Sisters of Bridget. The Goddess Brigid has many symbols — the forge, the hearth, the wheel, the crossroads, which represent transformation, as they stand between light and dark. There is also Brigid’s cross, which is said to bring good luck and to protect a home from fire. 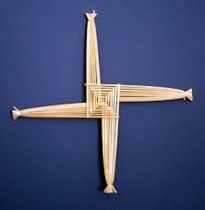 There are many websites that can help you with instructions on how to make your own Brigid’s cross. Brigid is celebrated on Imbolc, February 1st, which is a time of purification and cleansing. With her two opposite symbols of fire and water, it reminds us to always maintain a balance within our lives. This is a time of transformation, and new beginnings. Before your ritual, knowing that this is a celebration of purification and cleansing, you should bath first with a mixture of sea salt, epsom salt, baking soda and lavender oil. I wish you all a very blessed Imbolc and may Brigid watch over you.